Our 3-day personalized course teaches you how to perform professional bike fitting services. Perfect for retailers, coaches and clinicians who want to offer professional bike fitting services. This course leads to SICI certification and listing of fitter certification level on the SICI website. Certification and listing is only granted once the participant completes all the course requirements. There are no prerequisites to attend this level course. The personalized course is mandatory prerequisite for all other courses. Advanced classes cover a specific topic with a high degree detail and require the completion of a Personalized course. Designed for experienced bike fitters who want to enhance their skills and join the ranks of the best bike fitters in the industry. Must be SICI certified to enroll. Our curriculum is constantly updated based on the latest scientific research and input from our staff and graduates. 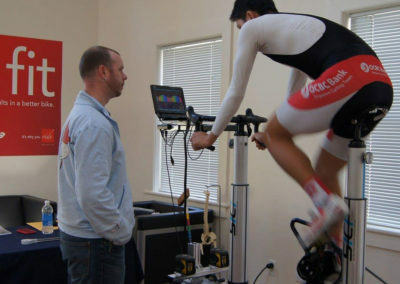 Our staff is comprised of some of the best and most experienced bike fit professionals in the industry as well as physical therapists, medical professionals and biomechanists in SICI advanced classes. Our classes are offered in the Boston Area, primarily. We have OPEN ENROLLMENT, our classes are open to everyone in the cycling community. SICI’s educational offerings are all focused on providing the theory, context and application of cycling science backed methodologies. Each course module begins with instructors explaining and demonstrating each fitting element and provides a hands on opportunity for the student to apply the new skills in a real fitting environment. Classes are kept intentionally smaller in order to provide the highest quality learning experience. Would you like to know about future classes? Which class(es) are you interested in? Serotta International Cycling Institute (SICI) offers classes, bicycle fitting equipment and consulting to bicycling retailers, coaches and clinicians. We are committed to the advancement of cycling science. Our commitment has led us to support the Medicine of Cycling Conference and the Interbike bike fit symposium. These vital gatherings allow both medical and retail minds to share knowledge across a wide platform of experience and backgrounds.